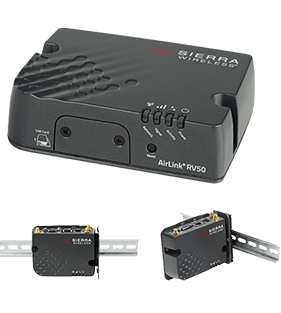 The Sierra Wireless RV50 is the industry’s lowest power and most rugged LTE gateway. Simple to install and easy to manage, the RV50 industrial gateway is designed to connect critical assets and infrastructure. Ideal for industrial-grade applications in energy, utilities and smart-city infrastructure, the RV50 provides real-time remote connectivity for SCADA, distribution management systems and metering. With the lowest power consumption available on the market, the RV50 dramatically reduces infrastructure costs when running on battery or solar power, and provides programmability to enable edge computing applications, using the ALEOS Application Framework (AAF). The RV50 adds LTE Advanced capabilities, supporting an extensive range of LTE bands worldwide, including Band 28 and Band 12, and delivering up to 300 Mbps downlink speeds.